A century ago a Gallentean astrologer named Damella Macaper prophesized the end of the world in a book called ‘The Seven Events of the Apocalypse’. Considered a hack and a nutcase by her contemporaries, the book was largely ignored outside the small circle of her cult following. A short while later Macaper died and her cult died with her as her followers dwindled rapidly. The book describes seven calamities that will befall the world, culminating in the “return of the dark light from the heart of the mother”, as Macaper described it. The book is written in a stylized prose and even if the general course of events can be followed, any detailed information is lacking. It can be deduced that the calamities will occur within a space of few months or years at the most, but when or where this will happen is not mentioned, decreasing the credibility of the prophecy as a whole. For decades ‘The Seven Events of the Apocalypse’ had been all but forgotten by everyone except a handful of scholars. But in recent months the eyes of the world have increasingly turned towards this old tome for explanations. A series of strange natural occurrences around the world seem oddly similar to the first calamitous events described in Macaper’s prophecy a century ago. Although few believe that the actual end of the world is near people is still wary and extensive studies are being carried out into the prophecy and other surviving Macaper texts for more clues on what the future holds for the world of EVE. The first event in Macaper’s prophecy she described as “the cosmetic kiss of the comets” and this is exactly what happened in a remote Caldari system almost a year ago, when two large comets collided head on. The clash occurred within the boundaries of the solar system, but not close enough to any of the planets to cause any drastic effects. Debris from the comets disturbed space traffic for a while, but that was all. 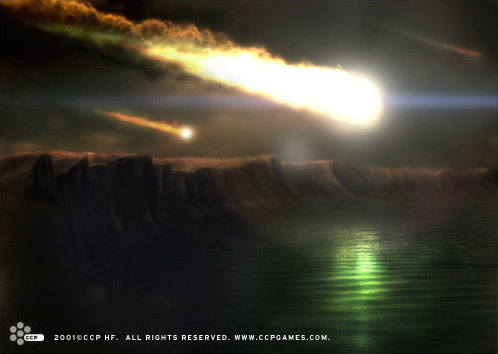 Albeit a very rare event, the comet collision was not connected to the prophecy at this time. The second event occurred a few months later when the planet Fricoure in the Gallente Federation was literally flooded with rains that lasted for weeks. Scientists could easily explain this by citing shifts in the weather patterns in the upper atmosphere and it wasn’t until a diligent astrology student pointed out the similarities between this downpour and the second event of Macaper’s prophecy that people began taking notice. The third calamity is described by Macaper as being a “roaring stone that silences the world.” A week ago a huge asteroid entered the atmosphere of the Amarrian planet Rumida at a low angle. It cut across the surface of the planet for hundred of kilometers with a thunderous roar before finally slamming into the ocean. In its wake lay the ruins of thousands of homes; destroyed by the powerful shockwaves created by the asteroid, the shockwaves plowing the earth along a path several kilometers wide. Casualties numbered a few thousand; fortunately the asteroid’s impact wasn’t close to settled territories. But Macaper’s prophecy came true in a very striking manner; dozens of thousands were left deaf by the meteor, as the sound waves streaming around it had exploded the eardrums of people many kilometers away from the meteor. The roaring stone had silenced the world for all those people and the name of Damella Macaper became renowned throughout the world. Four more events are to take place according to the prophecy and speculations about their nature abound. Many claim expertise in the prophecies, but none can inform us with any certainty about what is to transpire. The fourth event is described by Macaper as “the appetite of nothing expands over the world”; the fifth is described as “the little brother makes the final sorrowful steps home; he is not welcome”; the sixth is described as “what was many now becomes one when one becomes four”; the seventh is mentioned above. What this means is for anyone to guess, but the majority of people agree that Macaper’s prophecy has put the fate of humans into perspective for the public and the next few months or years should be interesting indeed to watch.